When I was in pastry school, we were continuously pelted with a plethora of baking methods we had to memorize. Many of them, we were told, were ‘the only way to do it’ or else we would eff everything up. Since my classmates and I didn’t know any better, hence the need for schooling, we believed it. We were sharply jolted into reality once we realized, that like just about everything else in life, there is more than one way to skin a cat. And when it comes to cooking, it couldn’t be more true. Some of my biggest cooking wake up calls came from the most unexpected place: working with a pastry chef from Azerbaijan while in Amsterdam. Our backgrounds were not comparable, she didn’t speak a lick of English, and I spoke no Dutch. In addition to the language barrier, many of her methods clashed with what I had been taught. I was mortified and helpless. When making a meringue, she would combine the egg whites with the sugar from the get go, and just let it whip. What!? We were told that you could NEVER do that, or else the meringue wouldn’t rise. Big Fat Fallacy. My brain would scream ‘She’s going to ruin that cake! !’ But she never would. Everything was fine. And now I do it her way. Combine butter and chocolate in a metal or glass bowl and place over a pot of simmering water. Once melted, stir to combine and take off heat. Let cool. Grease a 9×13 casserole dish and line with parchment paper. Combine egg yolks with the whole eggs and 1/2 c (100g) of the sugar in the bowl of a mixer. Start whipping with whisk attachment at a low speed (3 or 4). Let whip until pale and tripled in volume, about 15m. Add vanilla. Speed up to high for 3m. Fold about one cup of the egg yolk mixture into the chocolate. This helps lighten and cool down the chocolate mixture so that you can easily incorporate the rest of the egg mixture. Gently fold in the rest of the egg yolk mixture until mostly incorporated, but still a bit streaky. Preheat oven to 325F (165C). Thoroughly clean your whip and bowl. Any fats like butter or egg yolk will prevent your meringue from rising and becoming, well, meringue instead of egg white soup. (Gross.) Combine the egg whites with the remaining 3/8 c sugar in the bowl of the mixer. Whip on high until you have a shiny voluminous meringue with a medium peak, not too stiff. Keep an eye on the meringue so that it doesn’t over-whip. 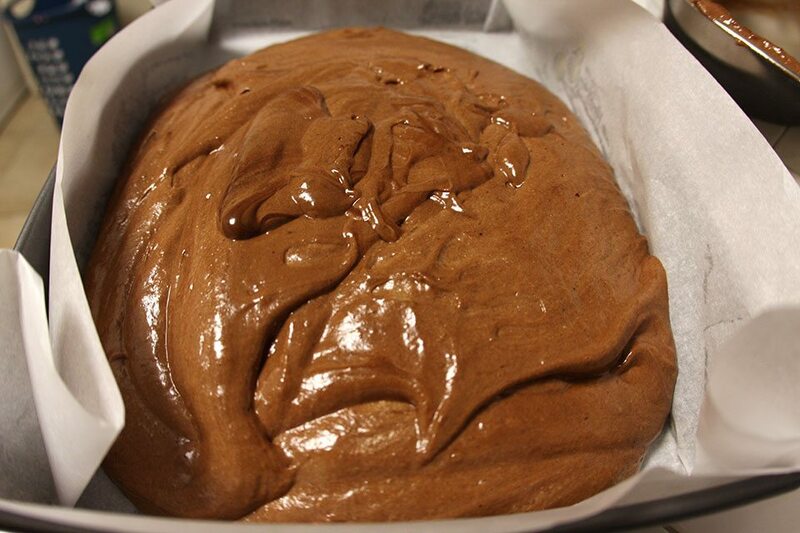 Gently fold the meringue into the chocolate egg mixture. Pour batter into prepared pan and gently smooth the batter out without deflating it. Bake for 35m until a toothpick inserted comes out clean. 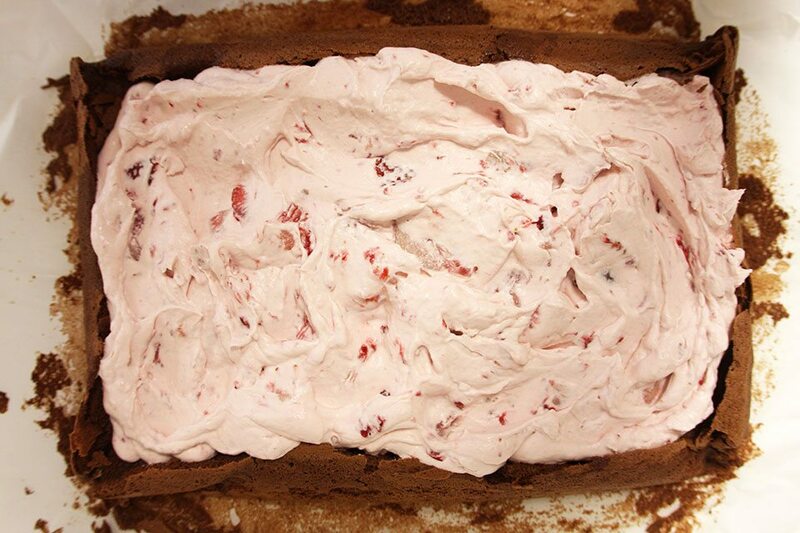 The cake will sink about 1″ or so while it cools, so don’t freak. Once cake is cool, pour the Marsala evenly over the cake. 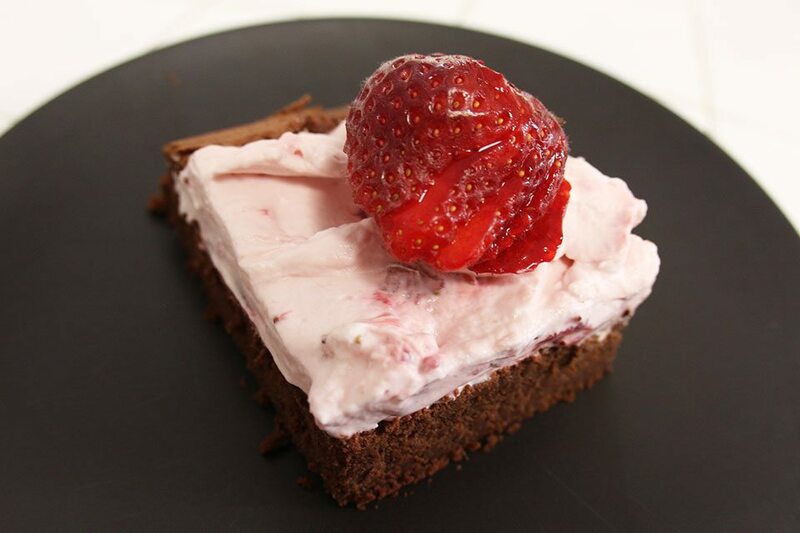 To prepare the creme, combine mascarpone, cream, sugar and strawberries in a mixer with the whisk attachment. Whip on med-high speed until thick. Spread creme on top of cake, but within the ridge around the edges.